Regardless of the fact that a triathlete will never need to do a flip turn in the middle of a triathlon, I believe the skill of being able to successfully incorporate flip turns into your workout sets helps you become a better swimmer. It may be awkward to learn and difficult to do all the time, but as this article from Beginner Triathlete details, there are definitely benefits. 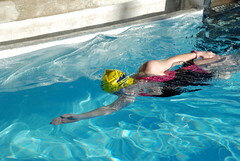 I encourage you to learn how to do better flip turns by watching the video demonstration. Ready for the last class? Tomorrow is the last class of the session, I hope everyone is able to attend. Don’t let the threat of cold wet weather scare you off, the pool will be nice and toasty. I’m sure there will be a few surprises or two too! See you on deck.